Home » Book of Mormon » Modern Origin of the Book of Mormon » Translation or Divination? Text and illustrations copyright © 1999 Institute For Religious Research. All rights reserved. The Church of Jesus Christ of Latter-day Saints has published many pictures of Joseph Smith dictating the Book of Mormon. These depictions invariably show Joseph seated at a table, carefully examining the gold plates which are in front of him on the table.1 The impression given is that the dictation process involved Joseph’s direct visual contact with the plates. It is difficult to avoid the conclusion that the LDS Church wishes to distance itself from the compelling evidence that Joseph Smith both discovered and produced the Book of Mormon in a context of magic/ divination/ clairvoyance. We encourage all members of the LDS Church and others who are interested in the LDS Church’s claims, to carefully review this important evidence. Here is the eyewitness testimony to Joseph Smith's dictation procedure, followed by some brief observations and conclusions. was one of the Three Witnesses of the Book of Mormon. The majority of the translation work took place in the Whitmer home. 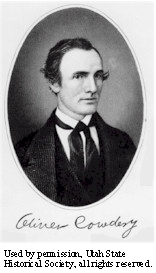 Martin Harris, also one of the Three Witnesses to the Book of Mormon, provided this information to his friend Edward Stevenson, who would later become part of the LDS First Council of Seventy. 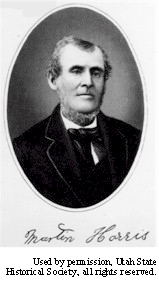 "Martin Harris related an incident that occurred during the time that he wrote that portion of the translation of the Book of Mormon which he was favored to write direct from the mouth of the Prophet Joseph Smith. He said that the Prophet possessed a seer stone, by which he was enabled to translate as well as from the Urim and Thummim, and for convenience he then used the seer stone, Martin explained the translation as follows: By aid of the seer stone, sentences would appear and were read by the Prophet and written by Martin and when finished he would say "Written," and if correctly written that sentence would disappear and another appear in its place, but if not written correctly it remained until corrected, so that the translation was just as it was engraven on the plates, precisely in the language then used." was Joseph's principal scribe for the Book of Mormon, and another of the Three Witnesses to the Book of Mormon. As described later in this article, Cowdery's use here of the terms "Urim and Thummim" was a common designation among Mormons after 1833 for Joseph's seer stone. 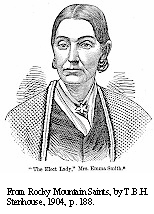 The testimonies of Emma Smith, Whitmer, Harris and Cowdery are corroborated by other eyewitnesses. 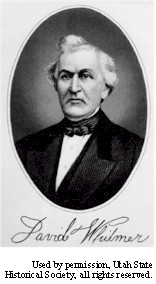 Prior to the 1971 discovery of the original court record of these charges, Mormon apologist Hugh Nibley, of Brigham Young University, wrote that "if this court record is authentic, it is the most damning evidence in existence against Joseph Smith. "13 This court examination (now proven) is indeed damning and most unseemly: For it means that Joseph Smith was engaged in fraudulent money-digging with the same magic "seer stone" method in 1826 — the very time period in which, according to his First Vision story, Joseph was receiving yearly visits from Moroni (1823-1827) regarding recovery of the Book of Mormon plates. This surely raises the question of whether, in his story of locating and translating the gold plates, he was simply trying to legitimize his use of an occult "seer stone" by carrying it over to a religious context. Excerpt from 1826 Bill of Justice Albert Neely. (Courtesy Clerk of the Board of Supervisors, Chenango County Office Building, Norwich, New York.) Click to see entire document..
What Was the "Urim and Thummim"? The term "Urim and Thummim" is mentioned seven times in the Old Testament (Exodus 28:30; Leviticus 8:8; Ezra 2:63; Nehemiah 7:65; Deuteronomy 33:8; Numbers 27:21; 1 Samuel 28:6 — in the latter two passages "Urim" is used alone.). In these passages the Urim and Thummim are presented as a means of divine revelation, and are frequently associated with the vestments of the High Priest, in particular the ephod and breastplate. The Bible gives no description of the object(s) that constituted the Urim and Thummim, nor of the manner of their use. The Urim and Thummim was not used after the time of David (about 1,000 B.C. ): "The basic reason for their demise seems to have been that God was weaning His people away from a physical means of revelation to a greater dependence on His word as written or as spoken by the prophets," according to the International Standard Bible Encyclopedia (2nd ed., pp. 957-59). It should be noted that the mention of the Urim and Thummim in Doctrine and Covenants 10:1, dated "summer of 1828," was written back into this revelation at a later date. In its original form as Chapter IX of the 1833 Book of Commandments, the revelation makes no mention of the Urim and Thummim 17 (view scanned image of 1833 Book of Commandments, Chapter IX). The mention of Urim and Thummim in what is now designated D&C 10:1 first appears in the 1835 edition of the Doctrine and Commandments, where it is found as Section XXXVIII. 1. See, for example, The Ensign, January 1996, p. 3; July 1993, p. 62; November 1988, p. 45; also, missionary pamphlet, "Book of Mormon: Another Testament of Jesus Christ," (The Church of Jesus Christ of Latter-day Saints, 1987). 2. Grant H. Palmer, An Insider's View of Mormon Origins Early Mormonism and the Magic World View (Salt Lake City: Signature Books, 1987; revised, expanded 1998, pp. 41-ff); James E. Lancaster, "By the Gift and Power of God," Saints Herald, 109:22 (November 15, 1962) pp. 14-18, 22, 33; Edward H. Ashment, "The Book of Mormon — A Literal Translation," Sunstone, 5:2 (March-April 1980), pp. 10-14; Richard S. Van Wagoner and Steven C. Walker in "Joseph Smith: The Gift of Seeing," Dialogue: A Journal of Mormon Thought, 15:2 (Summer 1982), pp. 48-68; Blake T. Ostler, "The Book of Mormon as a Modern Expansion of an Ancient Source," Dialogue: A Journal of Mormon Thought, 20:1 (Spring 1987), pp. 66-123; Stephen D. Ricks, "The Translation and Publication of the Book of Mormon," Foundation for Ancient Research & Mormon Studies, official F.A.R.M.S. transcript of video lecture, 1994, 16 pages. 3. 8 vols. (Independence, Missouri: Herald House, 1951), "Last Testimony of Sister Emma," 3:356. 4. David Whitmer, An Address to All Believers in Christ, Richmond, Missouri: n.p., 1887, p. 12. 5. Interview given to Kansas City Journal, June 5, 1881, reprinted in the Reorganized Church of Jesus Christ of Latter Day Saints Journal of History, vol. 8, (1910), pp. 299-300. 6. Edward Stevenson, "One of the Three Witnesses," reprinted from Deseret News, 30 Nov. 1881 in Millennial Star, 44 (6 Feb. 1882): 86-87. 7. Oliver Cowdery, Messenger and Advocatee, (Kirtland, Ohio, 1834), vol. 1, no. 1, p.14. 8. Affidavit of Isaac Hale dated March 20, 1834, cited in Rodger I. Anderson, Joseph Smith’s New York Reputation Reexamined, (Salt Lake City: Signature Books, 1990), pp. 126-128. 9. W.W. Blair interview with Michael Morse, Saints’ Herald, vol. 26, no. 12 (June 15, 1879), pp. 190-91 . 10. Cited in Dean Jessee, "Joseph Knight's Recollection of Early Mormon History," BYU Studies, vol. 17:1 (Autumn 1976), p. 35. 11. D. Michael Quinn, Early Mormonism and the Magic World View (Salt Lake City: Signature Books, 1987; revised, expanded 1998, pp. 41-ff); see also Ronald W. Walker, "The Persisting Idea of American Treasure Hunting" in Brigham Young University Studies, vol. 24, no. 4 (Fall 1984), pp. 429-59, and Fawn M. Brodie, No Man Knows My History: The Life of Joseph Smith the Mormon Prophet, 2nd ed (New York: Alfred A. Knopf, 1986), pp. 16ff. 12. Quinn, pp. 44ff. ; and H. Michael Marquardt and Wesley P. Walters, Inventing Mormonism: Tradition and the Historical Record (Salt Lake City: Smith Research Associates, 1994), pp. 70ff. 13. Hugh W. Nibley, The Myth Makers (Salt Lake City: Bookcraft, 1961), p. 142. 14. W.W. Phelps, Evening and Morning Star, vol. 1, no. 8, (Independence, Missouri, January 1833) p. 2., from photomechanical reprint of original. 15. Joseph Fielding Smith, Doctrines of Salvation, 3 vols. (Salt Lake City: Bookcraft, 1956), 3:225. J.F. Smith attempts to downplay the idea that Joseph Smith actually used the seer stone to produce the Book of Mormon. However, he does not identify the sources for the idea, nor does he offer alternative testimony, but instead asserts that all such information is "hearsay." 16. "Questions asked of David Whitmer at his home in Richmond Ray County, Mo. Jan. 14-1885 relating to book of Mormon, and the history of the Church of Jesus Christ of LDS by Elder Z.H. Gurley," holograph in LDS Church archives, cited by Richard S. Van Wagoner in "Joseph Smith: The Gift of Seeing," Dialogue: A Journal of Mormon Thought, 15:2 (Summer 1982), p. 54. 17. A photomechanical reprint of the original 1833 Book of Commandments can be found in Joseph Smith Begins His Work, vol. 2 (Wilford C. Wood, 1962). View scanned image of 1833 Book of Commandments, Chapter IX. Documentation Packet (6.35 MB) with photocopies of a number of the older, difficult to obtain, articles referenced in these notes. If you do not have a high speed internet connection and have difficulty downloading this file, email us your postal address and we'll send you the packet via postal mail. For a limited time the publisher is offering, to members of the LDS Church, a free copy of the research tool titled Where Does It Say That? It provides photographic duplications of key LDS sources that are often difficult to obtain. These sources document the LDS church’s teaching on various issues including: Adam-God, polygamy, the First Vision, and blood atonement. Click here to order. The eyewitnesses to the dictation of the Book of Mormon describe a different scenario than the one depicted by the LDS Church.